Dr Carl Johnson is the originator of the tapping algorithm used in Rwanda. It was developed together with Gunilla during a joint visit there. Dr Carl Johnson has spent over thirty years finding the most efficient way to treat PTSD. “My dream was to come to places like Rwanda, Congo and other to teach this treatment to people and have them experience the joy of the healing and then have them carry that knowledge on to others. Therefore my greatest thrill is that the work Gunilla Hamne and Robert Ntabwoba, Jacques Sezikeye and others (of peaceful Heart Network) have taken upon themselves – doing healing for so many hundreds of people and teaching so many more. 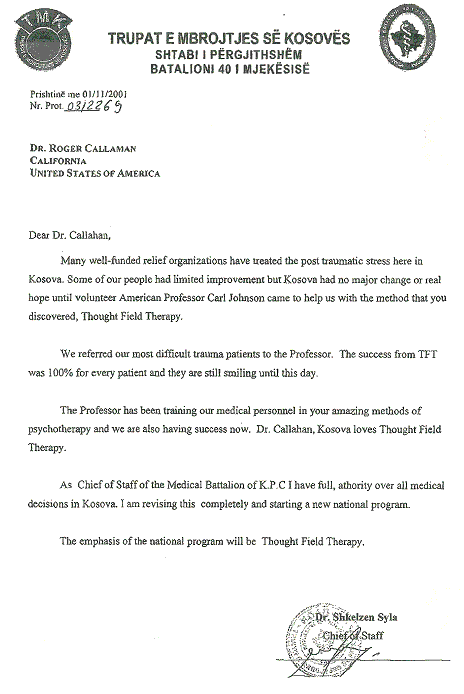 This letter from Kosovo shows the results perceived from Dr Carl Johnsons work there.